In this conversation, you will hear Diann discuss her personal history with ADHD and her recent diagnosis at the age of sixty. For years, this diagnosis didn’t seem possible, as she excelled in so many areas that her child with ADHD struggled in. Diann also talks about the value and importance of coaching. She is a member of the ADHD reWired Coaching and Accountability Group and shares why she joined the group and what she has gained from her involvement. [10:12] – Diann talks about coaching, and she describes her history with acting as a coach. It was in our ADHD reWired Coaching and Accountability Group that Diann decided to focus on people with ADHD. [11:40] – Diann explains what she has learned about herself through coaching other people. She also shares why she enjoys working with entrepreneurs. [13:32] – Diann talks about her personal discovery of ADHD and labeling. [18:43] – Diann shares her career path. She opens up about enjoying building things, but when it moves to the maintenance stage, she loses interest. [21:27] – Diann talks about her son being diagnosed with ADHD at the age of 8. Because she excelled in the areas that her son struggled, she didn’t see how she could also have ADHD. [26:15] – Diann explains how she perceived herself with ADHD. [28:00] – When she joined the ADHD reWired Coaching and Accountability Group, Diann realized that she is a perfectionist. [30:33] – At times, Diann wishes that she would have dealt with her ADHD earlier. [32:20] – Diann shares why she had an evaluation for ADHD at the age of 60. 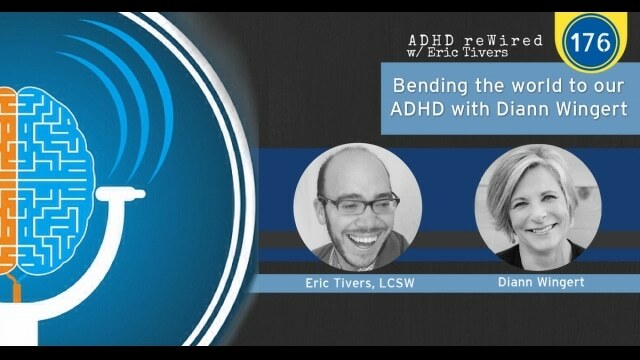 [47:14] – Diann explains why she joined the ADHD reWired Coaching and Accountability Group and what she has gained from this experience. [56:54] – Diann shares milestones on her path to acceptance. [1:01:01] – Diann is starting a podcast for women over 50 with ADHD. She talks about the future launch of this podcast and her coaching program.